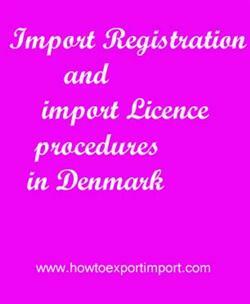 What are the procedures for registration as an importer in Denmark? How to get import licence in Denmark? How to start an import business in Denmark? What are the certification formalities to import to Denmark? How to get the status of an importer in Denmark? This post explains about import registration procedures to be obtained from Denmark government authority for importation to Denmark. All natural persons or legal entities are approved to conduct export and import process in Denmark. Every company in Denmark must be registered with a CVR number (Central Company Register Number) in the Danish Business Authority’s (DBA). Then, you need to register with the Danish Tax Authorities, SKAT (The Danish Customs and Tax Administration). For commercial purpose, a registered trade with concerned license (if required) as per the business and have enlisted in the Trade and Company Register of the country is must for exporting and importing of products from and to Denmark. Since Denmark falls under EU countries, a common trade policy is adopted to import/export most of the products . A separate rules and regulations are applied to specific products when importing and exporting in the European Union called Integrated Tariff of the European Communities (TARIC code). For any import, export or transit in EU countries, an EORI number is compulsory. EORI means Economic Operator Registration and Identification. The European Union (EU) legislation has required all member states to adopt the Economic Operators Registration and Identification (EORI) scheme. All importers, exporters and other transporters need to use a unique EORI reference number in all electronic communications with Customs and other government agencies involved in the international trade. This means that anyone involved with export, transit or import operations need to have EORI number. EORI number is related with CVR/SE number and dispensed in Denmark based on enrollment for import as well as export. Organizations in Denmark needn't to apply for an EORI-No. but, must be enlisted for import and/or export. If registered, a CVR-No. consequently turn into the Danish EORI-No. at the point when the prefixing a DK. This information is about import licensing procedures to import goods to Denmark. If you have to add more information about import permit and registration required to import goods to Denmark, share below your thoughts. Import Licence process in COPENHAGEN. Process to import to ESBJERG . Requirements of registration to import to SONDERBURG. Registration requirements in Aalborg to import. Registration needed to import to Aarhus. How can I register to import in Copenhagen. What Licence requited to import in Billund. What should I do to import goods in AARHUS . How to get import licence in COPENHAGEN. Procedure to get registration to import in ESBJERG . Mandatory process need to complete import in SONDERBURG. First permission required to import in Aalborg. How can I start import business Aarhus?. How to begin import trade in Billund? Permission to initiate to import in Copenhagen. The way to get registration to import in AARHUS . Import registration procedures required in AARHUS . How to get export order from foreign buyers? How to export from Burundi? How to Import to Burundi? How to import to India from Burundi? How to export from India to Burundi? How to import to India from Denmark? How to Import to Denmark? How to export from Denmark? How to export from India to Denmark?